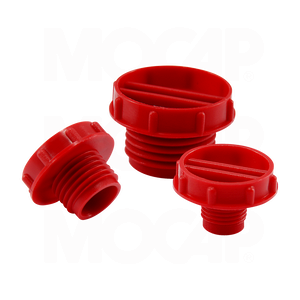 MOCAP General Purpose Plugs are designed for use on British Standard Pipe threads and fittings. These Threaded Plastic Plugs are ridged for ease with manual assembly, but can also be tightened with a screwdriver or hex wrench. Our GBP Series Threaded Plugs are moulded in Red polypropylene plastic and sized to plug BSP threads from 1/8 thru 1/2. Many Sizes of Our General Purpose Plugs for BSP Threads are Stocked for Immediate Shipment.